Today’s post is Part 1 of a 5-part series exploring the black-white racial empathy gap in the United States. Narratives – the specific ways that stories are told, retold, and infused with unique beliefs and perspectives – are invisible, yet their effects are not. They exert a powerful influence over our understanding and interpretation of our selves and the world around us. They shape our allegiances, sympathies, values, sensibilities, convictions, and passions, and therefore, the unspoken social contracts that we maintain with one another. But as we know, there are competing narratives. Some are predominant, some strive for predominance, and others clamor for basic acknowledgement. It’s not that either of these groups inherently lacks empathy. Both blacks and whites have tremendous capacity for empathy and compassion. They are, after all, human. What creates a problem between them is that for each group, as with every group that has a distinct ethnic and/or cultural identity, the empathy is highly contextualized to the framework that its unique narratives create. In other words, people are conditioned to feel empathy in certain contexts and under certain conditions but not others. Take a look at the following illustration, which consists of 2 images, each one associated with a specific narrative. Try to assess how each one affects you differently. 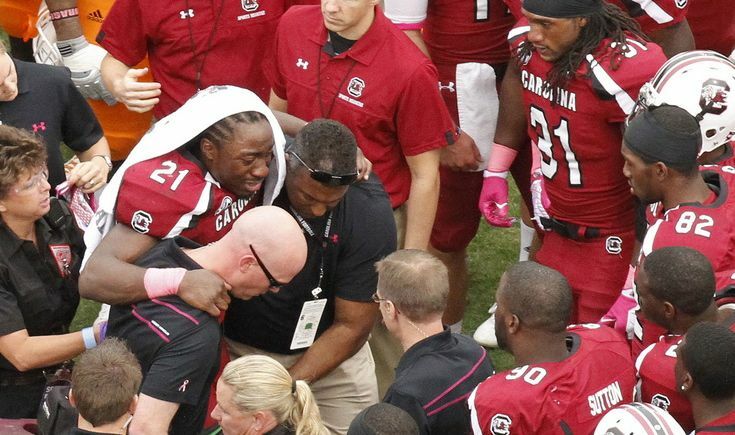 Marcus Lattimore, beloved former running back for the University of South Carolina, is pictured here being helped off the field after sustaining a devastating right knee injury on October 27, 2012. He had just managed to recover from a serious left knee injury sustained one year prior. The writer who reported on the 2012 injury in Fits News wrote, “While a catastrophic injury like this is terrible no matter who suffers it, Lattimore’s injury seems especially unfair given what a class act he’s been ever since arriving on campus three years ago. Throughout his record-breaking career at USC Lattimore has been a soft-spoken leader on the field and a humble, straight-laced student off of it.”  He has been described as both a consummate team player and a humble role model. He rehabilitated sufficiently in time to enter the 2013 NFL draft and was drafted by the San Francisco 49ers in October 2013. Unfortunately, the physical demands of the NFL proved to be too much for his damaged right knee. This past November, he announced his retirement from the NFL, as well as plans to return to USC to finish his degree. Did you feel a difference in your empathy meter between narratives? What do you think is going on? The first narrative is a societal-level narrative constructed from psychological and social science research. The second narrative is an individual-level narrative constructed from portions of Marcus’s life story. The two narratives do not represent two different people. They simply describe the same person in two different ways and through two different lenses. The difference is that while the second narrative probably evokes empathy in blacks and whites alike, the first is considerably less likely to evoke empathy among whites. In fact, it may actually have the opposite effect in some, triggering irritation and even anger. Why is that? This is where competing narratives come into play. In general, whites have no problem feeling compassion for an individual of any ethnicity or class if they are given a story to which they can personally relate. That’s why so many of them love and follow Brandon Stanton’s Humans of New York photography blog. But when they are asked or required to redirect their empathy from a single individual to an entire demographic group, namely young black men, several challenges arise. One of them is that doing so goes against a deeply held cultural belief that all merit, even empathy, is meant to be deserved and delivered at the level of the individual. Most (not all) whites genuinely believe that the United States operates as a meritocracy, which means that if you do the right things (work hard, make good choices), you will be rewarded; and if you do the wrong things (slack off, make poor choices), you will experience negative consequences. Since a significant portion of their personal experiences support this belief, they have little vision for the existence of factors beyond individual actions that may disprove it. This partly explains why there is so much emphasis on personal responsibility from whites in discussions about police shootings of black men. Within this paradigm, police officers only shoot people who deserve to be shot, and it has nothing to do with ethnicity. Any attempt to link a police officer’s use of deadly force to the race of the deceased or injured is labeled “race baiting” because in their minds, the only plausible explanation for it is that the person who was shot did something to provoke it. The personal responsibility narrative is held up as the standard and is used to render the racial bias narrative invalid, even before the racial bias narrative, which is layered and complex and requires time to unpack, has been fully explored or given a proper hearing. I hope some of you are at least wondering now, if you haven’t wondered before and even if you’re still feeling skeptical, that if the disparities in police treatment, in the criminal justice system, employment, and wages that black men are experiencing can’t be explained solely by individual actions, character, or criminality, then what’s really going on? The answer to that question, as it turns out, is very complex and requires a walk down America’s memory lane. It also calls for a close examination of the fate of a several-hundred-year-old narrative about inherent black inferiority and criminality – one that was once used to justify ownership of and brutality toward black people in this country, even as late as the 1960s. I will address these things in Part 2. Trawalter, Leslie; Hoffman, Kelly M.; Waytz, Adam. “Racial bias in perception of others’ pain.” Plos, November 14, 2012. Accessed at http://journals.plos.org/plosone/article?id=10.1371/journal.pone.0048546 on March 5, 2015.
racial_empathy_gap_people_don_t_perceive_pain_in_other_races.1.html on March 5, 2015. Obeidallah, Dean. “Our lack of racial empathy is appalling.” CNN.com, July 16, 2013. Accessed at http://www.cnn.com/2013/07/16/opinion/obeidallah-racial-sympathy/ on March 5, 2015. McKay, Tom. “One Troubling Statistic Shows Just How Racist America’s Police Brutality Problem Is.” Mic, August 18, 2014. Accessed at http://mic.com/articles/96452/one-troubling-statistic-shows-just-how-racist-america-s-police-brutality-problem-is on March 2, 2015. Martinez, Michael; Elam, Stephanie; Henry, Erica. “Within black families, hard truths told to sons amid Ferguson unrest.” CNN.com, August 21, 2014. Accessed at http://www.cnn.com/2014/08/15/living/parenting-black-sons-ferguson-missouri/ on March 3, 2015. American Psychological Association. “Black Boys Viewed as Older, Less Innocent than Whites, Research Finds.” March 2014. Accessed at http://www.apa.org/news/press/releases/2014/03/black-boys-older.aspx on March 3, 2015. Blake, John. “The New Threat: ‘Racism without Racists.” CNN.com, November 27, 2014. Accessed at http://www.cnn.com/2014/11/26/us/ferguson-racism-or-racial-bias/ on March 3, 2015. Mooney, Chris. “The Science of Why Cops Shoot Young Black Men. And how to reform our bigoted brains.” Mother Jones, December 1, 2014. Accessed at http://www.motherjones.com/politics/2014/11/science-of-racism-prejudice on March 3, 2015. Borowczyk-Martins, Daniel; Bradley, Jake; Tarasonis, Linas. “Racial Discrimination in the U.S. Labor Market: Employment and Wage Differentials by Skill.” Aix-Marseille School of Economics, Working Papers, April 2014. Accessed at http://www.amse-aixmarseille.fr/sites/default/files/_dt/2012/wp_2014_-_nr_13.pdf#overlay-context=fr/recherche/documents-de-travail/racial-discrimination-us-labor-market-employment-and-wage on March 6, 2015. Conlin, Michelle. “Off duty, black cops in New York feel threat from fellow police.” Reuters, December 23, 2014. Accessed at http://www.reuters.com/article/2014/12/23/us-usa-police-nypd-race-insight-idUSKBN0K11EV20141223 on March 3, 2015. “Marcus Lattimore Suffers Gruesome Knee Injury.” FitsNews.com. October 27, 2012. Accessed at http://www.fitsnews.com/2012/10/27/marcus-lattimore-suffers-gruesome-knee-injury/ on March 2, 2015. “Marcus Lattimore Out for Season.” FitsNews.com. October 16, 2011. 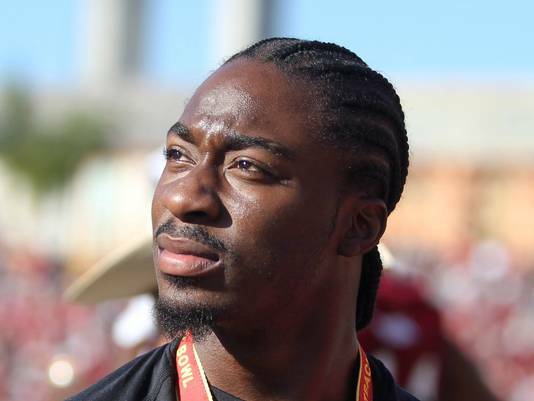 Accessed at http://www.fitsnews.com/2011/10/16/marcus-lattimore-out-for-season/ on March 2, 2015. Really well-written and helpful! Thank you! Both deal with facts and deserve empathy because of the reality that race imposes. I don’t understand seeing them differently. To reject the first Marcus that explains the realities in his life is to reject the second Marcus as well, who has experienced the same social/psychological/cultural expectations. You just know how he used his talent and skill to navigate that reality before and after his injury. You don’t know if or how Marcus # 1 coped, and it may be the norm for some people, but to assume he will not handle the elephant in the room-that they would deny him an equal chance to be every bit the man they see #2 as, is prejudice. Acknowledging the challenges every person of color will face should not mean most will fail if you don’t know their personal history and identify with them. Having that as a filter, means the observer is likely to pre-judge any black male, whose personal history is unknown.